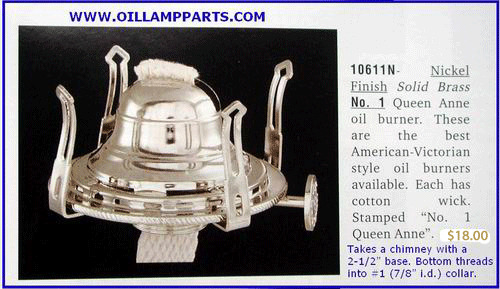 Solid brass NICKEL PLATED #1 size burner: This burner is typically used on small table lamps & larger hand (finger) lamps. The burner screws into a #1 size collar having a 7/8" inside diameter. Very smooth wick raising mechanism.It takes any chimney with a 2-1/2 to 2-5/8" base diameter (fitter).